Adzom Drukpa Drodul Pawo Dorje (Tib. ཨ་འཛོམ་འབྲུག་པ་འགྲོ་འདུལ་དཔའ་བོ་རྡོ་རྗེ་, Wyl. a 'dzom 'brug pa 'gro 'dul dpa' bo rdo rje) aka Natsok Rangdrol (Tib. སྣ་ཚོགས་རང་གྲོལ་, Wyl. 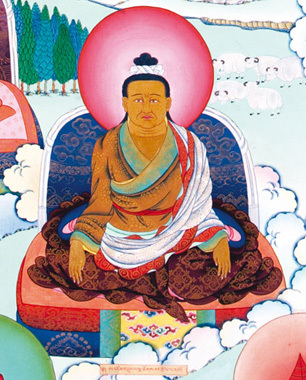 sna tshogs rang grol) (1842-1924) — an important master in the Dzogchen and Longchen Nyingtik lineage. He was a student of Shechen Öntrul Thutob Namgyal, Kathok Situ Chökyi Lodrö, Jamyang Khyentse Wangpo, Jamgön Kongtrul Lodrö Thayé, Patrul Rinpoche, Khenpo Pema Vajra, Nyala Pema Dündul and Mipham Rinpoche and a teacher of Tokden Shakya Shri, Tertön Sogyal Lerab Lingpa, Yukhok Chatralwa Chöying Rangrol, Tsö Patrul Rinpoche, and Jamyang Khyentse Chökyi Lodrö. Namkhai Norbu Rinpoche (b.1938) is considered to be his immediate reincarnation. Tulku Thondup, Masters of Meditation and Miracles, Shambahala, 1999, pages 228-229. Nyoshul Khenpo, A Marvelous Garland of Rare Gems: Biographies of Masters of Awareness in the Dzogchen Lineage, Padma Publications, 2005, pages 290-296. This page was last edited on 4 July 2018, at 06:58.